Home > Dot Coms / Internet > TheStreet.com, Inc. Beautifully engraved certificate from the TheStreet.com, Inc. issued in 2001. This historic document was printed by the American Banknote Company and has an ornate border around it with a vignette of the company logo. This item has the printed signatures of the Company’s Chairman and Secretary. TheStreet.com was launched by financial pundit James Cramer. TheStreet.com offers financial news, tools, and commentary on both its advertising supported flagship Web site, as well as on its subscription-based site, RealMoney.com. Fees from its 75,000 subscribers make up about 35% of sales. 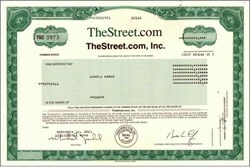 TheStreet.com also distributes content to partners such as America Online (AOL Time Warner) and MSN (Microsoft). After suffering years of losses, TheStreet.com has been trimming costs to try and reach profitability. It cut about 20% of its staff in 2001. Cramer and co-founder Martin Peretz each own about 12% of the company.